The Hannah Cabinet is Geoff Hannah’s largest, most iconic and technically accomplished cabinet in a series of four created over the last 30 years. Being interested in 18th and 19th century furniture, Geoff was lucky enough to be awarded a Churchill Fellowship in 1980 to examine the intricacies of French and English works of those times. Amongst others, Geoff studied the Louis XV Bureau du Roi in Versailles, Marie-Antoinette’s dressing table in the Louvre and the Fourdinois Cabinet in the Victoria & Albert Museum in London where he was granted after hours access to examine its secret locking mechanisms. Above: Within the Hannah Cabinet, the Marie-Antoinette secret drawer. Geoff’s cabinets go beyond the realm of furniture and the Lismore Regional Gallery, like Bungendore Wood Works Gallery before it, recognises the iconic status of his work and in particular the importance of The Hannah Cabinet to the Lismore Region and Australia. The Lismore Regional Gallery has taken on the challenge to raise $1,000,000 to purchase this magnificent piece for their permanent collection while also agreeing to make it available for travel within Australia for specific exhibitions. This world class master craftsman was adopted at birth from Coraki Hospital, attended school in Busbys Flat, was apprenticed in Lismore and still creates unique masterpieces in the region. Not overly interested in school, Geoff left at the age of 14 to become an apprentice cabinetmaker in 1963 with Brown & Jolly, the biggest country home furniture store in NSW. Geoff worked there for nine years making and restoring furniture before going out on his own with $34 in his bank account. 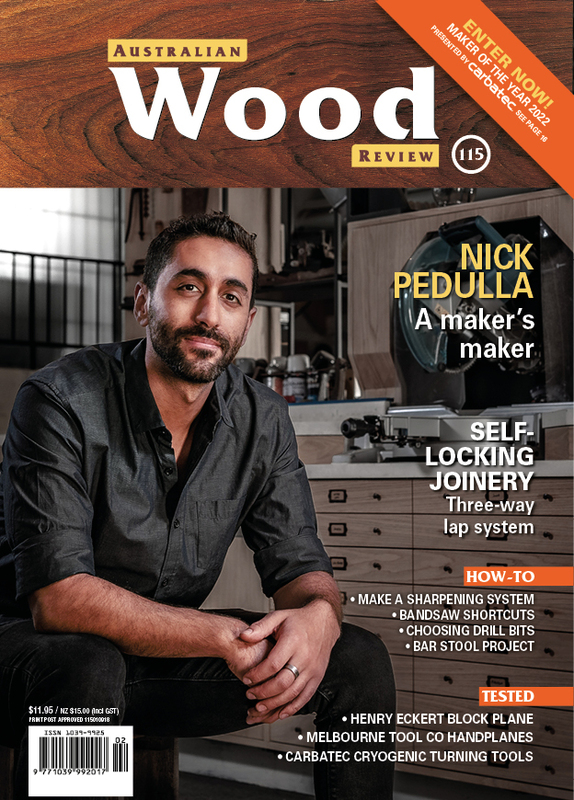 Geoff and his wife Rhonda, with two babies underfoot, worked hard to establish their business under their house restoring and creating new pieces, gaining inspiration from borrowed books until a local ophthalmologist helped him apply for the Churchill Fellowship. The Hannah Cabinet features lavish marquetry throughout. 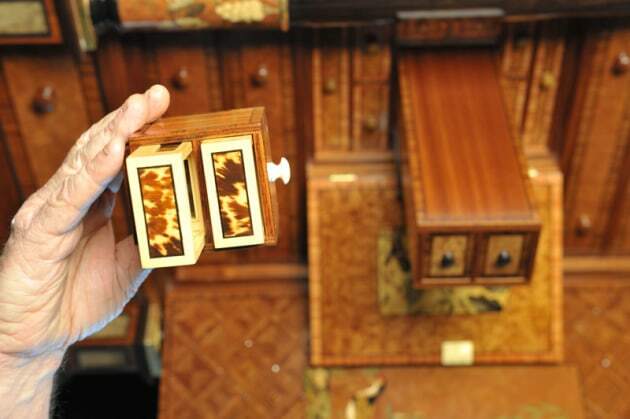 It wasn’t until 1988 that Geoff displayed his first intricate marquetry cabinet, The Bicentennial Cabinet, which was officially opened in the Sydney Opera House. The Yarralumla Cabinet followed in 1991 and is on display in the Governor-General’s residence in Canberra. In 2000, while visiting the Olympics in Sydney, a Belgium businessman recognised Geoff’s outstanding talent and quickly bought the Australiana Cabinet shipping it back to his office on the Grand Place in Antwerp. The Hannah Cabinet is the culmination of these unique cabinets and features marquetry, parquetry, 17 varieties of semi precious and precious stones, rare shells and even a piece of Marie-Antoinette’s summer bedroom silk boarder from Versailles. There are 34 different types of solid timbers and veneers with the main frame being mahogany and the six columns being carved from the one solid piece of ebony. The Hannah Cabinet has a treasure trove of secrets within. Four tall front doors open to reveal multiple drawers and a further 14 doors in tiers are decorated with veneer inlays of birds, bugs and flora. Several secret drawers have not been seen and will only be revealed to the ultimate purchaser. Tortoise shell drawers in the Hannah Cabinet, precious timbers, stones and other materials are extensively used. As well as being awarded the Churchill Fellowship, Geoff was made an Honorary Fellow of Southern Cross University in 2009 and was awarded an OAM in 2018 for services to the visual arts. If visiting the Northern Rivers region, an opening of The Hannah Cabinet takes place every Wednesday at 10.30am and every fourth Sunday at 11am at the Lismore Regional Gallery in Rural Street Lismore. The Hannah Cabinet Acquisition Team have come up with a unique way of raising money to purchase the cabinet by allowing 92 of the 140 drawers to be sponsored for $5,000/$10,000/$20,000/$50,000 or four Bird of Prey Drawers for $100,000 each.